At the back of his sunlit, peaceful house in Somerset, Don McCullin has a tiny workroom where he keeps his prints. There are boxes upon flat boxes, stacked on broad shelves like pizzas awaiting collection. The images are breathtaking. The first one out of the box is a still life of dark mushrooms lying on a slab of chipped concrete, a shiny wine jug behind them; it is an essay in textures and surfaces. 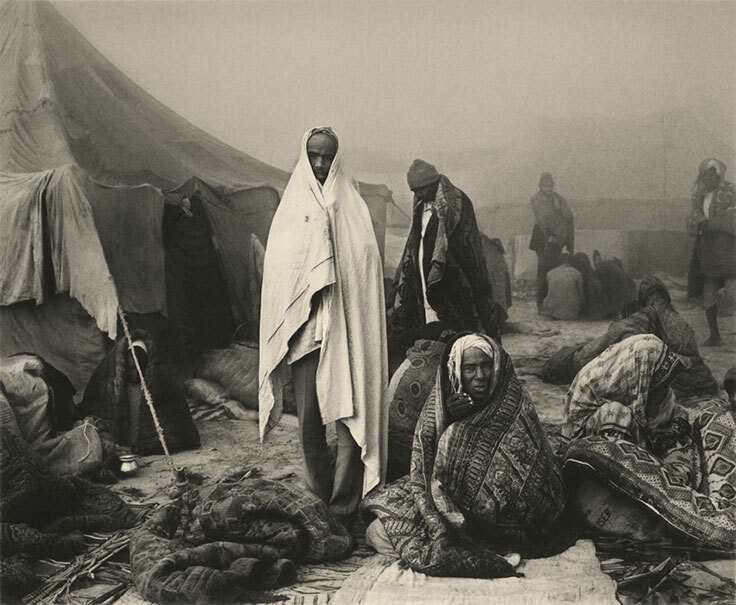 Then there is a group portrait of Indian pilgrims outside their tents at the Kumbh Mela: wrapped in their shawls and blankets, they look like Hebrew wanderers waiting for Moses to come down from the mountain. Perhaps the most stunning photograph in the set is a statue of Aphrodite from Leptis Magna, now an exhibit in Tripoli’s Red Castle Museum. It is a wonderful shape, the pitted torso illuminated by a single unseen bulb (‘No tripod: I had to stand stock-still for a fifteenth of a second at wide-open’). That battered goddess says a great deal about McCullin’s preoccupations: history, humanity, and the damage that humans do. It took a perverse stroke of luck to turn that impulse buy into the beginnings of a career. One night, back in Finsbury Park, a policeman was killed in a scuffle between gangs. McCullin, who had been experimenting with his Rolleicord, took some pictures of the lads he had grown up with — though they had nothing to do with the murder. Now he had a foot in the door of a newspaper, McCullin looked around for stories that he could pitch. It was 1961, and a political crisis was looming in Berlin, then under the military occupation of four armies — British, American, French, Soviet. McCullin told the paper that he wanted to go to Germany to cover it. Incredibly, the Observer was not interested, so McCullin went at his own expense, and shot the first days of the construction of the Berlin Wall. The pictures — which, needless to say, the paper was more than happy to print — won him a British Press Award and a regular contract. ‘That’s how life has been,’ says McCullin, ‘a series of episodes where I thought: I must go here, I must go there.’ He has a firm belief that his hunches always turn out to be right. Throughout his life, he has had the good journalist’s knack of turning up in the right spot at the right time. In 1967, during the Six-Day War, he headed for Jerusalem when the press pack went south to Sinai, and so was the only photographer present when the Israeli army took the Wailing Wall. In the 1970s — during what he calls his Hogarthian period — he shot the lost souls of Spitalfields and Whitechapel, somehow sensing that gentrification was on its way. More recently he published a beautiful book, Southern Frontiers, that explores the Roman remains strewn around the Maghreb and the Middle East — among them the very temples in Palmyra that have just been obliterated by ISIS. Those seem harsh self-judgments: to be present at a crime — even a war crime — is not to be complicit. But McCullin is adamant. 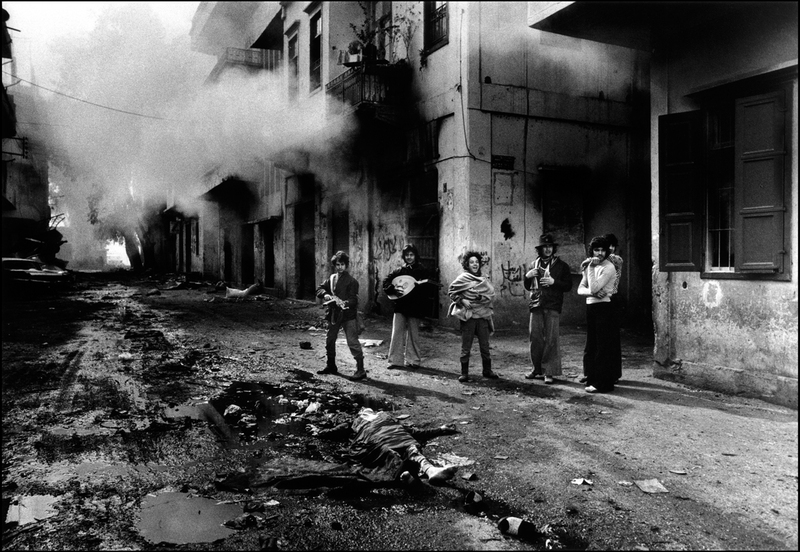 ‘I found wars exciting when I first went to photograph them. I thought this is fun, the bullets are flying, it’s a bit Hollywood. Then I started going to wars where the civilian population was suffering the most, and that brought about a change in me. What are documentary photographs of human misery for, then? What can they achieve? If — as seems reasonable to suggest — their function is to bear historical witness, then to take pictures of other people’s suffering is an entirely proper thing to do. As for the deep unease that McCullin feels, it surely derives from the fact that — however harrowing the events of the moment — part of his attention is on broadly artistic matters: composition, light, narrative, visual impact. McCullin pauses before he responds to this idea. ‘I was once in a stairwell in Beirut,’ he says. ‘Some Palestinians had been dragged out of their rooms — they were going to be shot. And as the shooting began, the men looked up and raised their hands like this…’ He lifts his own hands in a gesture of supplication, the five fingertips oriented upwards and almost touching, so that they make a shape like the head of a tulip. ‘They were calling to their God,’ he says. That eye contact is central to McCullin’s work, so much of which is portraiture — albeit portraits of people in distress or in extremis. He has never used a long lens: proximity is for him an essential part of the transaction, as if the subject were co-creator of the finished picture, or at least a collaborator in it. Dew Pond, Somerset, 1988. Gelatin Silver Print. Dimensions variable © Don McCullin / Contact Press Images. This entry was posted in Documentary Photography and tagged Don McCullin on January 17, 2017 by Leicaphila. Don McCullin doesn’t trust digital photography. Calling it “a totally lying experience”, McCullin, famous photographer of war and disaster, says that the transition to digital capture, editing and storage means viewers could no longer trust the truthfulness of images they see. One of the 20th century’s greatest war photographers, McCullin covered conflicts in Cyprus, the Congo, Biafra, Vietnam, Cambodia, Bangladesh, El Salvador, and the Middle East. He is the author of more than a dozen books, including his acclaimed autobiography, Unreasonable Behaviour (1990), and 2001’s retrospective Don McCullin. Winner of numerous awards, including two Premier Awards from the World Press Photo, in 1992 he became the only photojournalist to be made Commander of the British Empire (CBE). Under pressure of time, McCullin does use digital cameras for assigned work, but he remains committed to film, recalling one of his best experiences with film being just this year, standing on Hadrian’s Wall in a blizzard. “If I’d have used a digital camera I would have made that look attractive, but I wanted you to get the feeling that it was cold and lonely,” which it was, he said. For that, a roll of old school Tri-X or HP5 fit the bill perfectly. 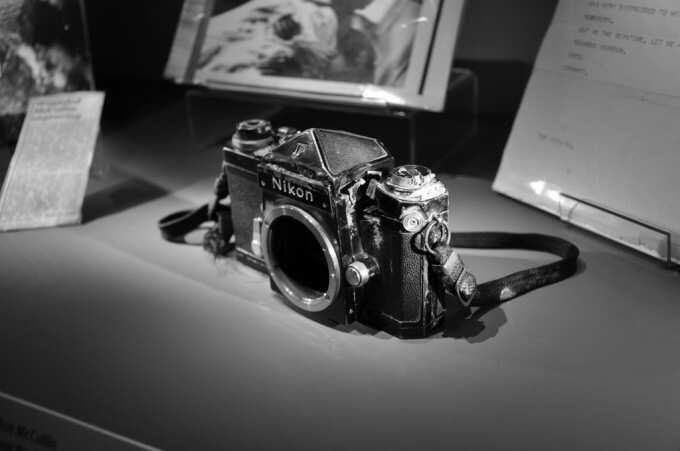 This entry was posted in Documentary Photography, Famous Leica Users, Film photography, Leica History and tagged Don McCullin on December 17, 2015 by Leicaphila.